You might wonder why I bother to share something that doesn't show an app, webpage or other "interface"-y type project. I chose to include this piece because not all problems come with standard solutions. The interaction design of this piece is about how people interact with each other, not only through devices, but in this case with public art in a shared space using gestural interactions. Use a public space to facilitate interaction. 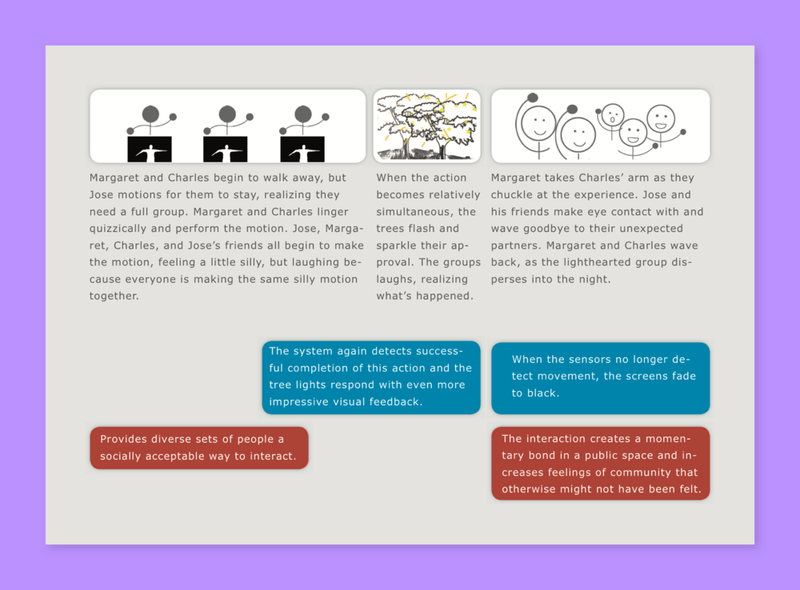 Since we wanted to facilitate interaction, we first needed to understand how people currently interact in public spaces. We took advantage of Carnaval in downtown Funchal, Portugal to observe how people take advantage of these spaces. Here are a couple of our observations. Adults will play when it's structured in the proper framework. If there is not a framework for it, adults will hold back. People really like to interact with art and light. Art and light displays brought people out of their shells, making them more likely to have spontaneous conversation. From our observations, we knew we needed to set up the right framework if we wanted adults to engage in creative play, and knew that art or lights would be a good way to engage them. 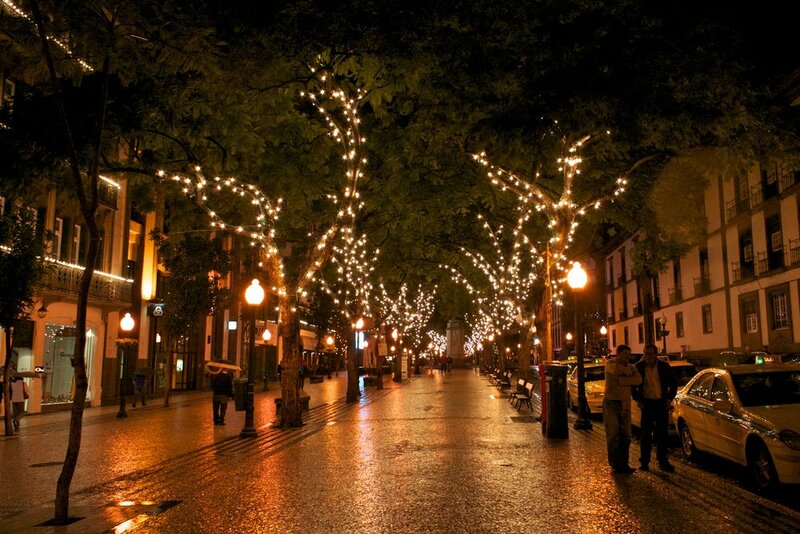 At night, the Funchal downtown plaza glows with tree lights. We thought a tree light display would be an excellent place for such a display. We had two primary personas: the elderly European tourists who arrive on cruise ships daily and Madeiran locals who pass time in the plaza. We based these personas on interviews we performed by intercepting people in the plaza. We devised a concept where passerbys would see a display showing a silhouette movement. When they copied the movement, the tree lights, using sensors, would light up and follow the motion of their hand. When additional people joined in, the lights would give bigger rewards, like flashing special patterns. This storyboard maps the service and system design, including the gestural interactions. The deliverable for this project was a video prototype where we demonstrated how the interaction would work in-person. We used sensors to follow and respond to our hand movements on our faked trees. Each laptop represents a monitor that would be set up in the plaza. The design resulted in a fun and playful interaction between people.